Welcome to the second part of Jesus and Josefa, a series of blogs and podcasts in which we cover some very moving words from our Lord to Sister Josefa Menendez, a very courageous, yet unassuming Spanish nun who practiced her vocation in France in the early 1920’s. As is often the case, God reveals Himself or otherwise bestows special blessings on those we might not think of as being very significant. Sister Josefa was one such person. She was by all accounts humble and yet quite good natured in performing her tasks at the convent in which she resided. Our Lord singled out Sister Josefa for some very important work, to articulate His thoughts about His religious and about humanity as a whole, and to help Him save souls in reparation for their sins. Jesus gave her many graces and many wonderfully transcendent moments with Him when He would show up in her cell at various times. However, as with other religious and laity alike, he also allowed her to experience great suffering, in atonement for sinners. She accepted these trials willingly and lovingly nonetheless. Our Lord, mindful of her love and her sacrifices, took her to our true home, Heaven, at the age of 33 in December of 1923. It was her very “littleness” as He called it, that made her such a good transcriber, as well as loving devotee, in His eyes! What He told her goes under the heading of a private revelation, which we are not required to believe as Catholics, but that nonetheless has a great deal of merit for meditations. Jesus’ words to Sister Josefa appear in two books: The Way of Divine Love (a detailed biographical account of her life) and Christ’s Appeal for Love (a shorter version). Both of these have the church’s imprimatur that there is nothing in them that is contrary to faith and morals. (Indeed, the late Cardinal Eugenio Pacelli recommended her work the year before He became Pope Pius XII in 1939!). These excerpts I’ve selected from Christ’s Appeal for Love are also available in audio form as a Podcast on the Our Catholic Prayers Podcast Page here. Future selections will be available in transcript form on the Our Catholic Prayers Blog page, as well as in audio form on the Podcast page. The Way of Divine Love is available in print and as an e-book. Christ’s Appeal for Love is available only in electronic form at this time. 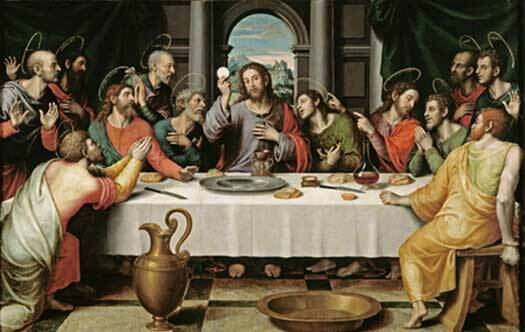 In this second part, Christ talks about His Introduction of the Eucharist at the Last Supper and its touching significance for our lives. Sadly nowadays, many Catholics, along with our fellow Christians of other denominations, don’t believe that Christ is really present in the Eucharist. Yet this doctrine is a firm pillar of our faith. It has been affirmed not only in the Gospels and in one of St. Paul’s letters (the first letter to the Corinthians, chapter 10, verses 16-17 and chapter 11, verses 23-25), but also in writings from the Church Fathers and theologians from the first century onward. I’ve included some links on this blog page below, as well as on the page for this podcast, for those of you who wish to study this further, for your discernment. When the priest utters the words of consecration at Mass, “This is my Body,” our Lord becomes truly present to us under the appearance of bread and wine. We don’t see Jesus as His disciples did 2000 years ago but He is there with us nonetheless, in Body, Blood, Soul, and Divinity! What we receive in Holy Communion is no longer bread (in the form of the consecrated wafer of bread we call a host) but Our Lord Himself under the appearance of bread. The great theologian and Doctor of the Church St. Thomas Aquinas, called this transubstantiation, a very fancy word, to be sure, but a sound theological doctrine nonetheless. Indeed, toward the end of his life, St. Thomas was blessed with a vision of our Lord from the crucifix in which Christ said to him “You have written well of Me, Thomas”. Talk about an endorsement! Jesus in the Eucharist is ready, indeed even eager, to give us the graces we need to live and love according to His will. Remember, at this point our Lord is truly present on the altar. The host is not a symbol! If you are a Catholic in a state of grace, that is to say with no mortal sins on your soul, which should be absolved beforehand in confession, you have your own private “audience” with our Creator and Savior when you receive Him in Holy Communion, in the Eucharist. And He desires more than anything to give you His graces then, to help you navigate your way through the troubled waters in your life, so that one day you may be able to have Eternal Life with Him in Heaven! Still, He will not force himself on any of us. One gets a profound sense from these excerpts not only of His powerful love for us but also of His great loneliness at what is all too often unrequited love. I’ve included dates in this section given in Christ’s Appeal for Love. These excerpts from the book were taken from his talks with Josefa during Lent in 1923. And now, drink in these words from Jesus slowly and thoughtfully at times. I hope they inspire you in meditative thoughts for your Rosary, Lenten devotions, and other prayerful moments! Remember, Jesus Christ, the second person of the Trinity, isn’t talking just to Sister Josefa Menendez here. He’s speaking to us as well, me and you! He really and truly wants to be an important part, you might even say an essential part, in each of our lives! God Bless. I will begin by discovering to you the thoughts that filled My Heart while I was washing the feet of My Disciples. Mark how the whole 12 were gathered together, none excepted: John the beloved was there, and Judas who was soon to deliver Me to My enemies. I will tell you why I willed to have them all assembled together, and why I began by washing their feet. I gathered them all together because the moment had come for My Church to be manifested to the world, all the sheep to have but one Shepherd. It was My intention, also, to show souls that I never refuse grace to those who are guilty of grave sin; nor do I separate them from all the good whom I love with predilection. I keep them all in My Heart, that all may receive the help required by their state of soul. But was how great was My sorrow to see in the person of My unhappy disciple Judas the throng of those who, though often gathered at My feet and washed with My Blood, would yet hasten to their eternal perdition. I would have these to understand that it is not the fact of being in sin that ought to keep them from Me. They must never think that there is no remedy for them, nor that they have forfeited forever the love that once was theirs. No, poor souls the God who has shed all His Blood for you has no such feelings for you! Josefa, let your soul be seized today by an ardent desire to see all souls, especially sinners, come and purify themselves in the waters of repentance. Let them give themselves up to thoughts of confidence, not fear, for I am a God of pity, ever ready to receive them into My Heart. We are going on with Love’s secrets. I will tell you My reasons for washing the feet of My apostles before the Last Supper. In the first place I would teach souls how pure they must be to receive Me in Holy Communion. I also wished to remind those who would have the misfortune to sin that they can always recover their innocence through the Sacrament of Penance. And I washed the feet of My apostles with My own hands, so that those who consecrated themselves to apostolic work may follow My example, and treat sinners with humility and gentleness, as also all others that are entrusted to their care. I girded Myself with a white linen cloth to remind them that apostles need to be girded with abegnation and mortification, if they hope to exert any real influence on souls. I wished also to teach them that mutual charity, which is ever ready to excuse the faults of others, to conceal them and extenuate them, and never to reveal them. Lastly, the water poured on the feet of My apostles denotes the zeal which burned in My Heart for the salvation of the world. The hour of Redemption was at hand. My Heart could no longer restrain its love for mankind, nor bear the thought of leaving them orphans. So, to prove My tender love for them and in order to remain always with them until time has ceased to be, I resolved to become their food, their support, their life, their all. Could I but make known to all souls the loving sentiments with which My Heart overflowed at My Last Supper, when I instituted the Sacrament of the Holy Eucharist. My glance ranged across the ages, and I saw the multitudes who would receive My Body and Blood, all the good It would effect. How many hearts I saw that from Its contact would bud fourth virginity! And how many others It would awaken to deeds of charity and zeal! How many martyrs of love did I see. How many souls who had been enfeebled by sin and the violence of passion would come back to their allegiance and recover their spiritual energy by partaking of this Bread of the strong! Who can describe the overwhelming emotions that filled My Soul? Joy, love, tenderness…But, alas, bitter sorrow also. Later I shall continue, Josefa. Go now in My piece; console Me, and do not be afraid; the well spring of my blood is not exhausted, and It will cleanse your soul. I want to tell them of the poignant sorrows which filled My Heart at the Last Supper. If it was bliss for Me to think of all those to whom I should be both Companion and Heavenly Food, of all who would surround Me to the end of time with adoration, reparation, and love, this in no wise diminished My grief at the many who would leave Me deserted in My tabernacle and who would not even believe in My real presence. Into how many hearts defiled by sin would I not have to enter… and how often this profanation of My Body and Blood would serve for their ultimate condemnation. Sacrileges and outrages, all the nameless abominations to be committed against Me passed before My eyes…the long, lonely hours of the day and of the night in which I would remain alone on the altars…and the multitudes who would not heed the appeals of My Heart. Ah! Josefa, let the thoughts of My Heart sink deep into yours. It is love for souls that keeps Me a Prisoner in the Blessed Sacrament. I stay there that all may come and find the comfort they need in the tenderest of Hearts, the best of Fathers, the most faithful of Friends Who will never abandon them. The Holy Eucharist is the invention of Love. Yet how few souls correspond to that love which spends and consumes itself for them! I live in the midst of sinners that I may be their life, their physician, and the remedy of the diseases bred by corrupt nature. And in return they forsake, insult and despise Me! Poor pitiable sinners, do not turn away from Me. Day and night I am on the watch for you in the tabernacle. I will not reproach you. I will not cast your sins in your face. But I will wash them in My Blood and in My Wounds. No need to be afraid…come to Me. If you but knew how dearly I love you. And you, dear souls, why this coldness and indifference on your part? Do I not know that family cares, household concerns, and the requirements of your position in life, make continual calls upon you? But cannot you spare a few minutes in which to come and prove your affection and your gratitude? Do not allow yourselves to be involved in useless and incessant cares, but spare a few moments to visit and receive this Prisoner of love. To one who speaks in this way and has a genuine desire of showing love, I answer: Beloved, if such is your desire, suffer Me to grow them for you. Let Me delve and dig in your garden. Let Me clear the ground of those sinewy roots that obstruct it and which you have not the strength to pull up. Maybe I shall ask you to give up certain tastes, or sacrifice something in your character…do some act of charity, of patience or self-denial…or perhaps prove your love by zeal, obedience, or abnegation; all such deeds help to fertilize the soil of your soul, which then will be able to produce the flowers and fruit I look for. Your self-conquest will obtain light for a sinner. Your ready patience under provocation will heal the wounds he inflicted on Me, will repair for his offense and expiate his fault. A reproof accepted patiently and even with joy will obtain for a sinner blinded by pride the grace to let light penetrate his soul and the courage to beg pardon humbly. All this I will do for you if you give Me freedom. Then will blossoms grow quickly in your soul, and you will be the consolation of My Heart. Yes, My beloved even your falls comfort Me. Do not be discouraged, for this act of humility which your fault drew from you has consoled Me more than if you had not fallen. Take courage, go forward steadily and let Me train you. All this was present to Me when I instituted the Blessed Sacrament and My Heart glowed with desire to become the food for just such souls. If I have taken up My abode among men is not merely to live among the perfect, but to uphold the weak, and sustain the lowly. I will make them grow and become strong. Their good resolves will be My solace and I will rest in their wretchedness. Write today concerning the pain endured by My Heart, when being constrained by the fire that consumed It, I devised the marvel of love, the Holy Eucharist. And while I looked at those souls that would feed on this heavenly Bread, I could not but see also the indifference by which so many others…consecrated souls…priests…would wound Me in this Sacrament. There were those who would grow cold…gradually yield to routine…and worse than routine…to weariness and lassitude, and little by little to tepidity. Still, I wait all night and watch in the tabernacle for that soul, fervently hoping that she will come and receive Me…that she will converse with Me with all the trust of the bride, telling Me of her sorrows, her temptations, her sufferings, asking My advice and begging for the graces she needs for herself or others. Perhaps she has dependent on her or in her family souls that are in danger and far from Me? Come, I say to her, let us discuss everything with perfect freedom. Be concerned about sinners. Offer yourself to make reparation. Promise Me that at least today you will not leave Me alone…then see if My Heart is not asking something of you to comfort It. This is what I hoped to obtain from that soul and from many another. Yet when she receives Me in Holy Communion she barely says a word to Me. She is distracted, tired, or put out. Her whole mind is absorbed by her occupations, her family cares, her acquaintances…or maybe her health. She does not know what to say to Me. She is indifferent, bored…wishes it were time to go. Is it thus that you receive Me, O soul whom I have chosen and for whom I have watched with all the impatience of love throughout the livelong night? Yes, I yearned for her coming that I might rest in her and share her anxieties. I had prepared fresh graces for her but she does not want them. She has nothing to ask of Me, neither advice nor strength. She just complains to herself without so much as addressing Me. It seems then that she has come simply out of routine, to go through a customary formality, or perhaps because no grave sin prevented it. But it is not love nor a true desire for close union with Me that has impelled her coming. Alas, that soul does not possess the delicate love I had hoped to find in her. And priests? Who can express all I expect from each of My priests. They are invested with My own power, that they may forgive sin. I Myself am obedient to their word when they summon Me from heaven to earth. I am totally surrendered into their hands. They may confine Me to the tabernacle or give Me to the faithful in Holy Communion. They are, so to say, My almoners. To each I have entrusted souls that by their preaching, their direction and above all their example, they may guide them in the path of virtue. What response do they make? Do they all fulfill Love’s mission? Will this My minister at the altar confide the souls of his charges to Me today? Will he entreat of Me the strength he needs to carry out in holiness his sacred ministry?...zeal to work for the salvation of souls…courage and self sacrifice, more today than yesterday? Will he give Me all the love I expect…and shall I be able to rely entirely on him as on My dear and well-beloved disciple? Oh, what cruel sorrow for My Heart, when I am forced to say: “The world wounds Me in My hands and in My feet and it sullies My countenance. My chosen souls and My consecrated religious, My priests, they rend and break My Heart. How many priests after giving back grace to many souls are themselves in a state of sin. How many say Mass thus…receive Me thus…live and die thus. Now you know what anguish oppressed Me at the Last Supper when I saw in the midst of the Twelve the first unfaithful apostle, and after him so many more who would follow him in the course of the ages. The Blessed Sacrament [the Eucharist] is the invention of Love. It is life and fortitude for souls, a remedy for every fault, and viaticum the last passage from time to eternity. In it sinners recover life for their souls; tepid souls true warmth; fervent souls, tranquility and the satisfaction of every longing…saintly souls, wings to fly toward perfection…pure souls sweet honey and rarest sustenance. Consecrated souls find in it a dwelling, their love and their life. In it they will seek and find the perfect exemplar of those sacred and hallowed bonds that unite them inseparably to their heavenly Bridegroom. And with these words from Jesus we conclude this second look at His moving recollections given to Sister Josefa Menendez, in this case covering the Eucharist. In the next installment, Jesus talks about His agony in the Garden of Gesthemane, His arrest, and the Denial of St. Peter. We will be uploading that part soon. As a reminder, this blog post is also available as a Podcast on our Podcast page. Wishing you a Blessed Lent!